Fitness is a topic which gets flung around very often. People speak of general fitness and an overall healthy lifestyle, yet while they do mention specific exercises, many fail to point out the best sports for overall fitness. Here are the best sports which are great for general fitness. Swimming is a perfect sport which allows you to train your entire body, all of it. You can work out every muscle in your body, including your cardiovascular system. 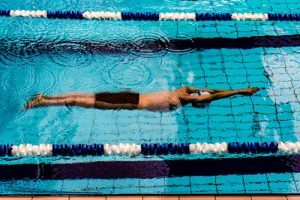 Swimming can engage every muscle, including the heart. Swimming is also great if you want to increase your VO2Max, which is the maximum amount of oxygen a person can consume during an exercise which increases in intensity, also called incremental exercise. Some would not call it a sport but a way of life and many would argue that such a statement would be true. To avoid further semantical debates, the physical aspects of parkour target the entire body, from dynamic exercises like running, climbing and jumping, to proprioceptive ones like walking on a rail. The fitness benefits of parkour are obvious, especially if people can see through all the flare and false PR which often portrays parkour as just climbing buildings and jumping from one rooftop to another. Gymnastics target every muscle in the body, to perfection. Cardiovascular exercise is a must, and so is an exercise of mental toughness. It is impossible to achieve greatness in gymnastics without being able to hold on through the tough times. Occasional gymnastics is a great way of targeting all the muscles in your body and staying fit, without dealing with all the stress of a professional lifestyle. Something as basic as running should be a part of everyone’s weekly routine, if possible. Running releases endorphins and makes you happier, while also providing a plethora of health benefits, for your heart and your bones, as well, not to mention your respiratory system. Running is great, especially for people who live a sedentary life, which is a lot, given the all the advancements in technology. Even though some people usually think of wrestling as you see it on TV, the popular kind, this type of wrestling is a bit different. This olympic sport includes various types of wrestling, the most prominent type being Greco-Roman wrestling. But whether you opt for that or Turkish oil wrestling, you are certainly going to have a great, full-body workout. Often ranked as the healthiest sport in the world, squash is great for the body and the mind. Practicing fitness and hand-eye coordination is what you get with this sport, as well as a lot of fun. These are the best sports for overall fitness, all of them having more than one benefit.